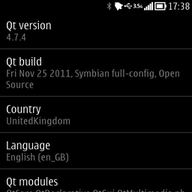 Use this tool if you want to know what version of the Qt framework you have installed in your Nokia smartphone. The application will also show details about the features supported by Qt in the current build, including among others audio & video formats and fonts. UC Browser, widely known as " UCWEB " , is a mobile browser featured with its fast connection, leading compression, powerful download management and stable functions. Try it and let it be your daily choice! Utilitiesby: picoBrothersDescriptionUse the screen as a flashlight with 7 different colors or to flash SOS. It takes no extra space in your pocket and is always with you. Use it as night light, to send morse code or why not guide an aircraft on the taxi way. New in this version is a SOS button, that makes the phone flash SOS in morse code. Get it now, it could save your life one day..
يناير 7, 2009Opera Mini, doesn't show proper abairc on my mobile.and Iwish to ask you about a PDF reader please.. you know I'm Z750 :)thanks ya Mohamed for your help..